In this passage from John Jesus was telling his disciples to continue in His love. This means that as believers we need to live a life that purposes to love even the most hateful people on earth. We do this because God first loved us and out of gratitude for the love of the Father we love others. The ability to love even the most unlovable person is only possible with the help of the Holy Spirit … that love is part of the fruit of the Holy Spirit (Galatians 5:22-23). Prayer can be simple: (1) Don’t be anxious about it; (2) Thank God for all that He has given to you and (3) Boldly and humbly approach the throne of grace with your needs. Acts 2:41–42 Then they that gladly received his word were baptized: and the same day there were added unto them about three thousand souls. And they continued stedfastly in the apostles’ doctrine and fellowship, and in breaking of bread, and in prayers. Acts Chapter 2 is where we learn of the development of the first church. We see that pattern of believing, being baptized and continuing “stedfastly” in studying the word of God and in the fellowship of like believers. Be sure to invite new believers to spend time with you and your church family for fun and meals. They will learn that hanging around with like believers strengthens their faith and replaces their desire to engage in activities that might not honor the Lord. They will learn by example! 2 Timothy 3:12 Yea, and all that will live godly in Christ Jesus shall suffer persecution. Matthew 5:44–45 But I say unto you, Love your enemies, bless them that curse you, do good to them that hate you, and pray for them which despitefully use you, and persecute you; That ye may be the children of your Father which is in heaven: for he maketh his sun to rise on the evil and on the good, and sendeth rain on the just and on the unjust. Luke 6:22–23 Blessed are ye, when men shall hate you, and when they shall separate you from their company, and shall reproach you, and cast out your name as evil, for the Son of man’s sake. Rejoice ye in that day, and leap for joy: for, behold, your reward is great in heaven: for in the like manner did their fathers unto the prophets. 1 Peter 3:15–16 But sanctify the Lord God in your hearts: and be ready always to give an answer to every man that asketh you a reason of the hope that is in you with meekness and fear: Having a good conscience; that, whereas they speak evil of you, as of evildoers, they may be ashamed that falsely accuse your good conversation in Christ. Okay, so maybe this is even more difficult for the new believer than learning how to pray. Be sure to teach your new brothers and sisters in Jesus how to share the simple news of the gospel. There are a few ways to do it, here are a couple. The Romans Road, read about it here: What is the Romans Road to Salvation? Ask them who “whosoever” is. Make sure they know that this means “ANYONE” including them. And also ask them who the “him” is … of course the answer should be Jesus and if not remind them that the “him” is “the only begotten Son”. Make sure that they know that “perish” means “to die”. Then ask the most important question: “Do you believe that Jesus died for you?” If they do not understand ask what questions they have. If their answer is “YES” rejoice with them and invite them to church! Discipleship of new believers is essential for growth in Christ and you can start discipling a new believer today with these simple steps. You will find peace and joy as you work with your new brother or sister and you will even find a new friend. 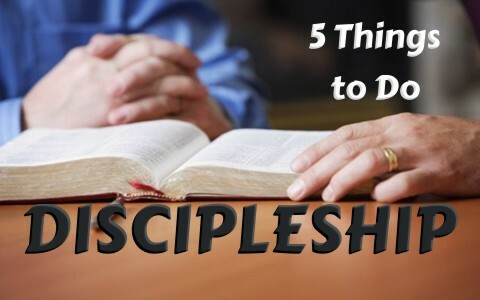 Related reading for you: What is Discipleship? Previous post: I Have Faith, So Why Didn’t God Answer My Prayer? Next post: Is Behavioral Therapy Biblical?